tattoos were sinful in my book because of that one little verse in Leviticus that had been taken out of context, twisted to fit a certain ideology and wielded as a weapon by the mainstream church. and then i got divorced. and then my whole world came crashing down around me. and then the very “brothers and sisters in Christ” i had so proudly linked arms with for nearly a decade deserted me. and then i started to see that perhaps this faith-walk is not meant to fit into neat little boxes. i realized that life was messy and beautiful and hard, and maybe all the things i had been so sure of i didn’t really know all along. 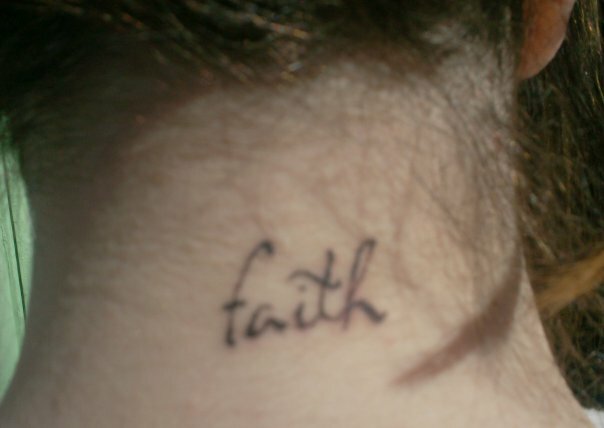 so i got a tattoo, the word “faith” in small, delicate lettering on the nape of my neck. at that point in my life, faith was the only thing i had to hold on to. everything i had known, everything that had been comfortable and supposedly secure had been stripped from me. i was hanging on by a thread, and that just happened to be the last little bit of faith i had in me. it seemed fitting for me to mark my body with that one little word, to serve as a remembrance in later years that faith as small as a mustard seed truly was enough. two years later, i got tattooed again. the word “hope” was etched into the thin skin of my foot, big and bold, hinting of promises of a better tomorrow. i had come out of the fire, tested and still standing on the truth. i understood that though i couldn’t change my past, Jesus could somehow make good of it and give me a new story in exchange for all my broken pieces. i came to know something of this Living Hope, one that could not be taken away by pain and circumstance. hope had become a mantra of sorts, something to cling to as i walked through my healing, and i wanted my body to tell the story. shortly after, i packed two fifty-pound suitcases for a journey that would forever change me. i left behind the memories of another life, the woman i used to be, and traveled halfway around the world, settling in the small nation of Liberia, West Africa, to serve Jesus by loving orphans. in the nearly four years i lived in Africa, i healed, i laughed, i cried, i prayed, i loved. in the midst of poverty and the aftermath of war, with death and sickness and injustice all around me, i learned what it felt like to have my heart break for the very things that broke the Father’s. as i held dirty, hungry and dying children in my arms, i would weep silently, rocking them and praying that somehow my love would be enough to heal their heart-wounds. i grew to embrace a culture so very different from my own, a people who deserved so much more. Liberia took a lot out of me, and i have since left the mission field full-time. i gave when i felt like i had nothing left in me; i was stretched to the point i was sure i would break; i loved deeper, fiercer, wilder than i ever thought possible. but each time i look at the wrist of my right hand, i see a reminder of the place that taught me what true love looks like, a land of red earth and green trees and blue sky that i will carry with me for the rest of my life. and this i know, friends: my story is not over. there are chapters still being written, still unfolding, even as i write this today. 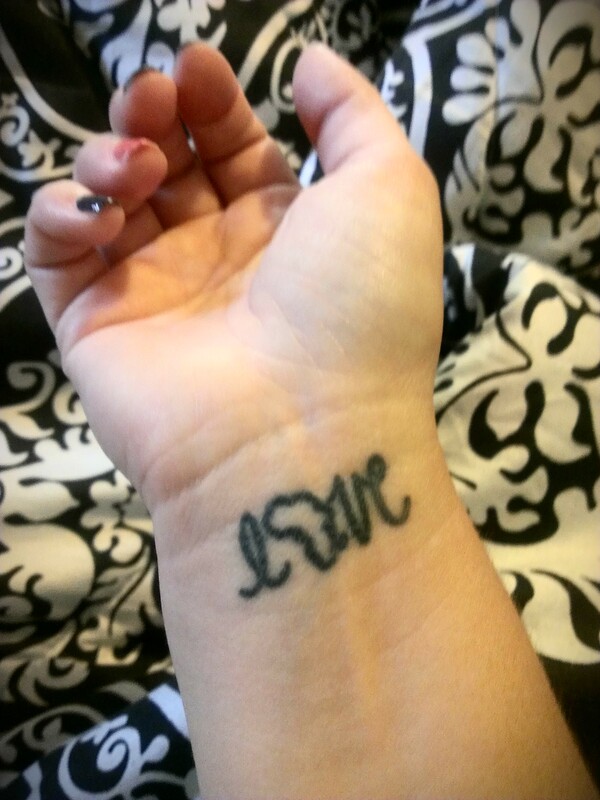 i may not mark each of them with ink, but they will be no less real, no less permanent, no less a part of me. i regret not one of the tattoos i’ve gotten; i wear them proudly, my battle-wounds from the crazy-beautiful mess we call life. and i believe one day i will sit at the table with my Jesus, and i will show him these scars, and he will show me his, and we will talk about them and laugh and cry and remember. Elena, thanks for sharing your ink, your stories. Faith, hope and love – a perfect trio to tell your story of restoration. I’m connected to community development work in Burundi as well as enjoying friendships with many Africans through Amahoro Africa. Love the people, the places and know both the beauty and hardship of the continent. So glad you shared with us today! kelley, it was an honor to be part of the project. i loved your post on deeper story, and it truly inspired me. thanks for being beautifully fierce + fiercely honest. i love that you too understand fully the complexities Africa brings – thanks for commenting! thanks for reading, Shari! i loved having the opportunity to share with the world what my ink means, how it serves as a remembrance of what i’ve come from. I love that the chapters of your life are physically marked on our bodies. This happens in so many other subtle ways but here you are declaring it yourself and it’s so meaningful. Thanks for sharing the stories of your tattoos! what a beautiful comment, Fiona. thank you, truly. yes, our experiences are carried with us in so many ways throughout our lives, whether we choose to acknowledge it or not. i am thankful for each of my tattoos, as they are a declaration that i know where i’ve come from – and that i know where i’m going. Your trio of faith, hope, and love is beautiful. God is so faithful. Praise Him for walking with us each step of the way. yes, Christine! i do not advocate getting a tattoo just for the sake of having one, but i chose the three to be a trilogy of sorts. they serve as reminders, stark and permanent, that God is faithful and has walked with me through each chapter. thank you so much for your comment; there is something quite comforting in knowing that others truly understand something of our stories, isn’t there? i pray that you’ve since found a loving, supportive church community to walk with you in all seasons of life – including that beautiful in-between. What a remarkable journey you have been on Elena, thank you for sharing bits and pieces of beauty and broken that are embodied not only through your tattoo’s but also through your writing. This is a truly beautiful and moving reflection, Elena. thanks so much, dr. v! your kind words mean so much.